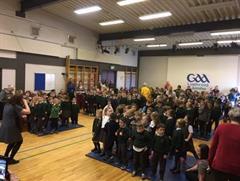 Tháing Dara Ó Cinnéide Chiarraí agus Dr Pól Ó Donnaille ó Ghaelfast chun na scoile! 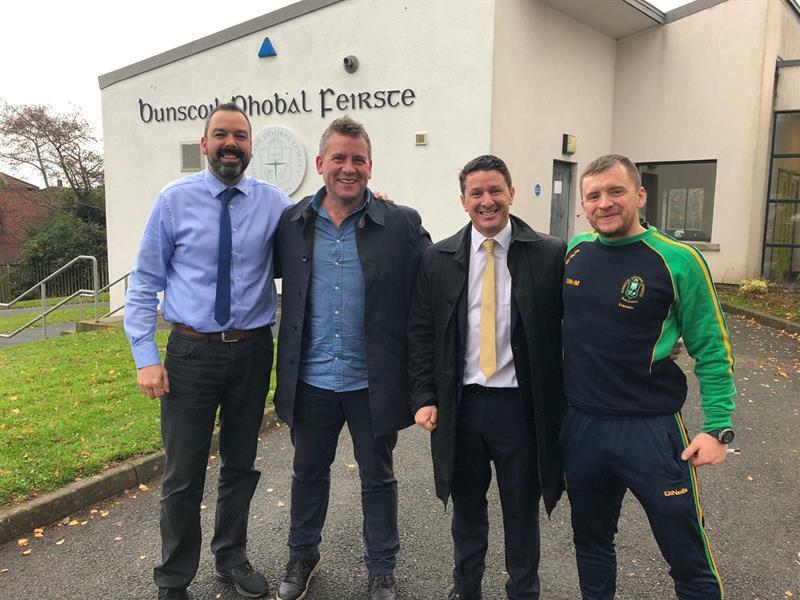 As part of the Gaelfast initiative, Dara Ó Cinnéide, the Gaeltacht man and former Kerry All-Ireland Football winning Captain was in town with the Gaelfast director Dr Paul Donnelly. They came to BPF for lunch and talked GAA! 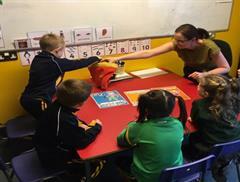 Bhí cúpla cuairteoir speisialta sa scoil ar na mallaibh chun labhairt linn faoi chúrsaí Chumann Lúthchleas Gael. Tháinig ceannaire gaelfast an Dr Pól Ó Donnaille chun na scoile agus ghlac sé laoch peile Ciarraíoch leis- Dara Ó Cinnéide! Bhí trathnóna iontach again agus chuidigh Dara linn ár ngeansaí nua a leanseáil. Thaitin na dathanna leis ar ndóighe! As part of the Gaelfast initiative, Dara Ó Cinnéide, the Kerry Gaeltacht man and former Kerry All-Ireland Football winning Captain was in town with the Gaelfast director Dr Paul Donnelly. 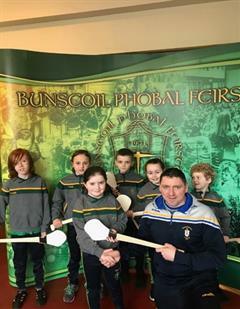 They visited Bunscoil Phobal Feirste for lunch, during which Dara Ó Cinnéide officially launched the new School Jersey. It was very appropriate that Ó Cinnéide launched this particular shirt as it is the same design as the Kerry Jersey! 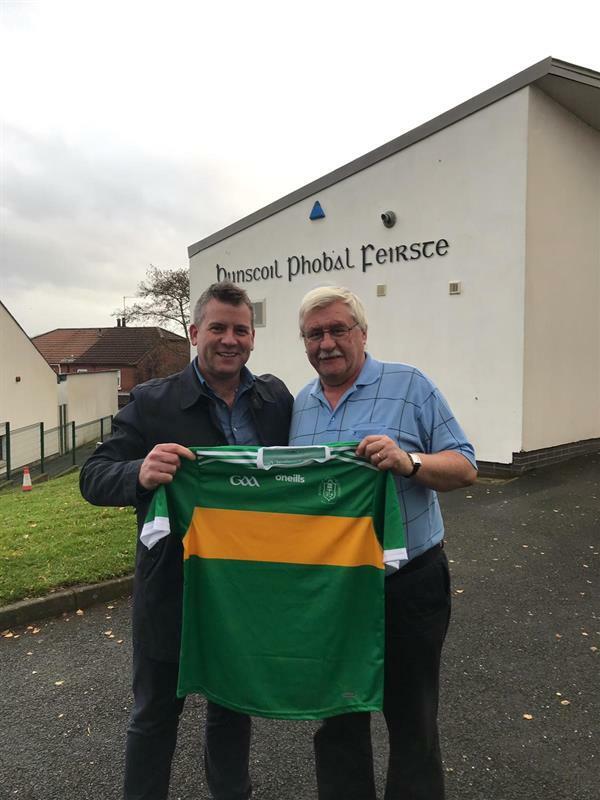 Ó Cinnéide himself loved the jersey design and was delighted when he was presented with his own Bunscoil Phobal Feirste jersey by our very own former All-Ireland Football winner, Ray our patrol man. Ray was Goalkeeper for the Antrim All-Ireland winning U21 Football team of 1969. Two legends together swapping stories of All Ireland glories! The new Bunscoil Jersey design is based upon one of our original shirts from the 1980’s which itself was then based upon not only the School colours but also the famous Kerry 4 in a row All-Ireland champions of the time. A brilliant afternoon was had with Dara and Paul as the School discussed all things GAA and took part in interviews for RTE. Go raibh maith agaibh a chairde! BPF abú!